Wedding centerpieces to add that extra oomph to your wedding table decoration! Wedding centerpieces are a great way to amp up your wedding reception decoration. These wedding table decorations come in various themes and perfectly help to elevate the look of your guests' dinner table. Right from floral wedding centerpieces to elaborate Indian wedding table centerpieces, I have curated a list of top 10 wedding centerpieces that will give you major #decorgoals! Inspired by the beauty of trees, these wedding centerpieces have branches spreading in all directions, which are decorated with everything from flowers, leaves, crystals and candles! A tree-inspired wedding centerpiece is a good idea to use in an indoor setting rather than an outdoor one! Using birdcages or aviaries is a major decor trend right now! So why not use it to your benefit and add a beautiful aviary decorated with flowers, lights or candles as the wedding centerpiece on your wedding table decorations? Using umbrellas as Indian wedding centerpieces is the best idea ever! The range of colours and patterns you can find in decor umbrellas is practically infinite! Pick umbrellas that complement other colours of your decor and pep them up with some flowers, drapes or crystal danglers! Are you in love with lights just as much as I am? Well then, these wedding table decorations that use bulb strings, fairy lights and all kinds of mood lighting are just the perfect style of wedding centerpiece for your big day! If you want to keep your wedding table decoration minimal to avoid clutter, then you can opt for wedding centerpieces in the form of ceiling danglers. Creating a canopy of flowers or lights and suspending them from the ceiling just over the reception table decoration is a great idea! Let’s admit that candelabras look every bit of royal. Placing elaborate candelabras as wedding centerpieces with your wedding table decorations will surely give your decor an opulent look. 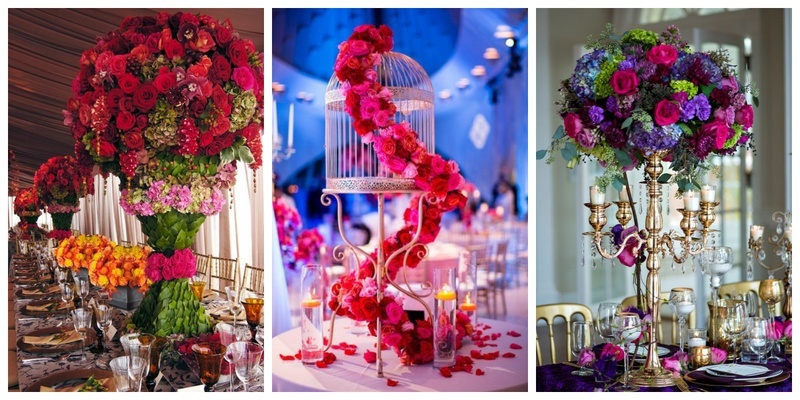 Decorating the candelabras with flowers or crystals will only take the look of the wedding centrepiece a notch higher! Chandeliers are a great way to spruce up the look of your wedding table decorations. While you may already have a wedding centerpiece in place, suspending a chandelier over the wedding table decor will give it a bright and glamorous vibe. If your personal style is elegant and minimalistic, then these wedding centerpieces are just the right pick for you. Simple yet alluring, all of them have minimal use of flowers, candles and other decor material, making the wedding table decoration look immaculate and graceful. Got a penchant for floral decor? Take a cue from these wedding centerpieces that make use of extravagant floral arrangement to create a royal look. Tip: You can use just one colour and one type of flower across the wedding table decor if you want a sophisticated look, rather than a vibrant one! So, which of these wedding centerpieces are you going to show your decorator for inspiration?